I love snow! I love building snow people! I love dice! I love dice games! 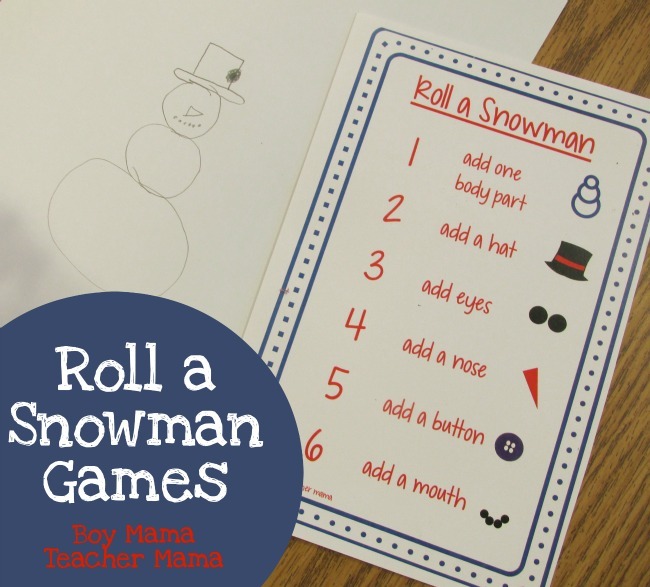 I put them all together and come up with four Roll a Snowman Games for the new year. Well, actually one of them is a Pick a Snowman Game, but you get the idea. FOUR games reinforcing FOUR different concepts. How fun! NOTE: When playing, all players must get a body first before adding any other features. You can have students get one body part at a time to total 3 body parts (that means rolling a 1 three times) or you can have students roll a 1 just once and get a complete snowman body. Players can add as many buttons as they like for each 5 they roll. 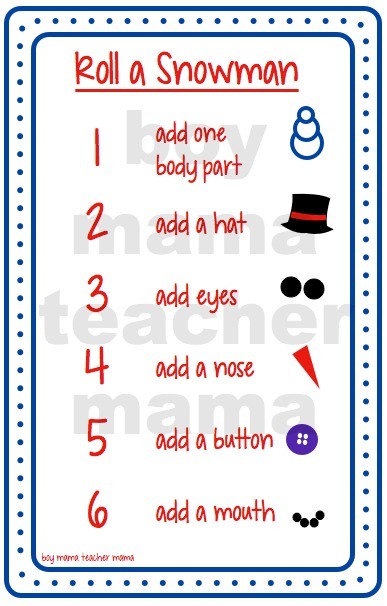 This is your basic roll the die and add a body part to the snowman game. Simple, but every kid loves it. It is a great math center game for the younger ones and could also be a fun game for a wintery celebration. This is a FREEBIE! Simply click the image below to download this game card. Enjoy!! 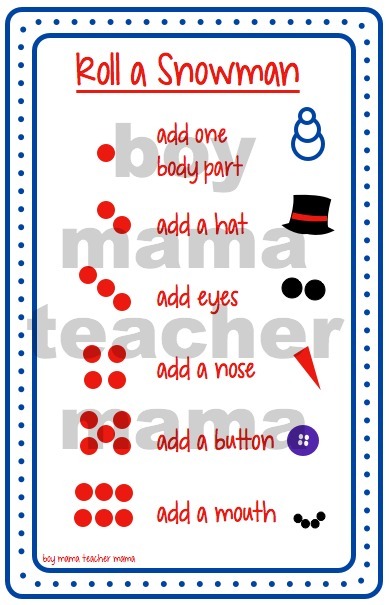 Play just like above only using the dice dots instead of the numerals. This game takes a bit more preparation than Roll a Snowman. 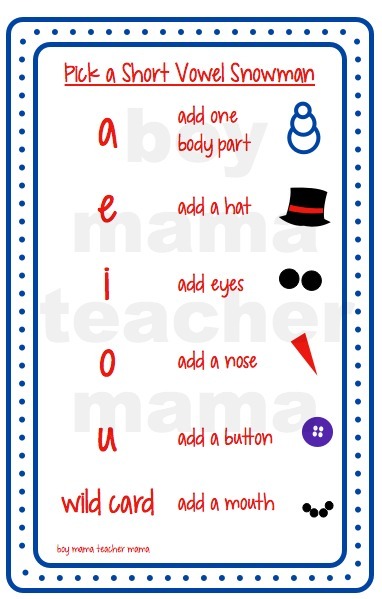 First, decide which sight words you would like your child or students to practice. Write them on the lines on the game card. Then use the die template and write those same words on the die. 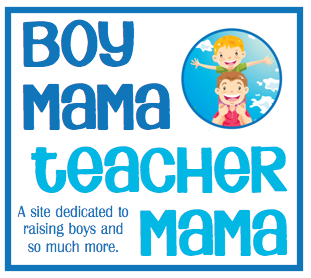 Alternatively, you can use a small wooden building block and write the words on the sides of the blocks. 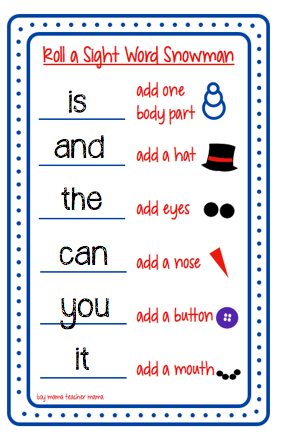 Or, if the die is too much work simply use sight word cards. Play the game the same way as Roll a Snowman. 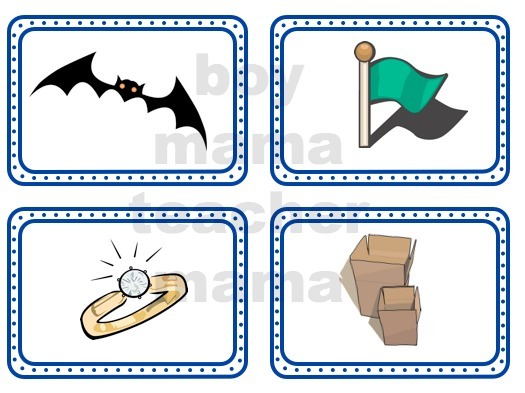 For this game, use the short vowel picture cards. Place all the cards in a pile face down. Each player chooses a card during his turn, determines the short vowel sound and then adds that body part to his snowman. Looking for other Roll a Game? Click the image to see more. 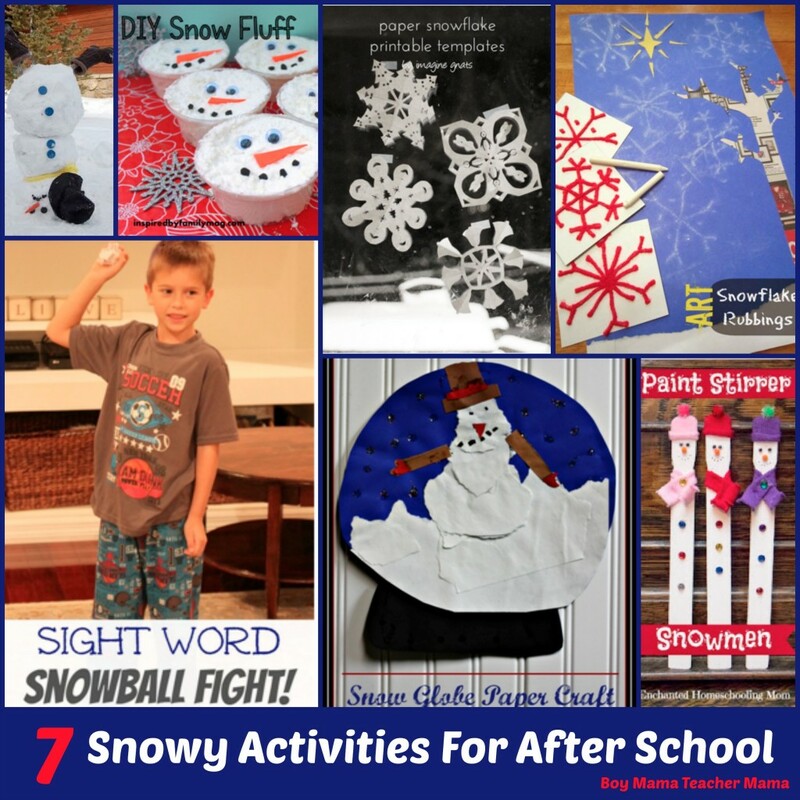 With all the snow that has been falling, here are some snow-related activities to do with your children after the school day is over. Thank you- this is awesome! Thank you so much for including our torn paper snowman / snowglobe. 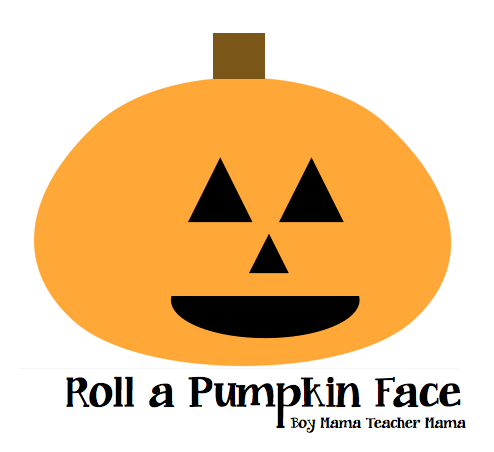 I just did it with an entire class of 3rd graders and everyone loved it! Each child had their own spin on what it should look like. Some students did use sharpie markers for the black details… looked great too!